I wrote this poem inspired by conversations I had with members of the public passing by the Hippopothames sculpture that I was poet-in-residence for during September. To be clear, there were lots of people who had very positive responses to the giant floating hippo – from a quick glance and a grin as they cycled past, all the way up to parents and kids who stopped to write hippo haikus with us, and couples who had come from abroad to take photos of themselves down on the fore-shore with this barrel-backed behemoth proud in the background. Probably my favourite was the Polish construction worker who told me he had first seen the hippo on the news on TV back in Poland, in his living room with his kids. He had arrived in the UK a week or so later to discover that he was working at the top of a huge new tower-block with a perfect birds-eye view of the sculpture, and had popped down on his lunch to take a photo to send back home! I was though more interested in those people who for whatever reason struggled with the very fact the thing it existed. Out of a few initially difficult but ultimately very entertaining chats came this poem! I blogged a few months back about the spoken word road-trip movie for theatres I’m making with director Peader Kirk. The show is called ‘No More Worries’ and has been co-commissioned by Apples and Snakes and the Albany. As part of the final project we think we might like to shoot a series of extracts from the full piece in various locations as we tour the theatre performance – mini-films which viewed in sequence would tell the whole story of the show. The aim with this trial one (masterfully filmed and edited by Karim Kamar as part of our Arts Council funded R&D phase) was to get close to the vibe of what it is like seeing me perform the piece live, but mix that up with a few more cinematic flourishes here and there. Hope you enjoy it! Heavy traffic, engines roaring loudly, bursting our ear wax. Clanking and drilling from the construction site. Seagulls squawking, white and grey. of the wall between the path and the river, feel it crumbling. We are in this busy place. This happy and excited place. To see a hippo. A massive wooden hippo with pink nostrils shaped like strawberries. The King Kong of the water. Heavier than a helicopter. The Fat Farter from Jupiter with eyes like giant eggs. going under Vauxhall bridge as a red double decker bus drives by above it. In the distance, London eye. Another bridge, another bridge, another bridge. Rustling tree leaves. Birds speaking. as we listen closely, boats making ripples. by Battersea power station, with its 4 massive chimneys. water coming out a tiny pipe on the opposite bank. Some people sit on benches, smoke cigarettes, eat snacks. But we are in this relaxed, lazy place to see a hippo. Some fat-bellied chubby-legged elephant size leader of the swamp. The Queen Hippo rules the Thames with no care. The hip hop huge loud King Botamus looking colourful. PS the awesome photo at the top is by Steve Stills for Totally Thames Festival. I had a lot of fun writing the piece, and was really inspired by going to chat to Florentijn when ‘horatio’ was still under construction. To find the place I had to head way out east to a tucked away spot in the depths of the docks, between the river and the runway of City Airport. I had landed in a strange place where teams of highly skilled carpenters construct your most surreal dreams from tall piles of timber. What inspired me most about chatting to Florentijn was the idea that the art is also the activity the object creates – it acts as a catalyst or spark for human engagement, for re-imagining the area. With this in mind, an important part of his final piece is the newly permitted access to the fore-shore where the hippo is moored. The playful almost cartoony appearance of the thing attracts people to engage with the area in a different way. In my role as poet-in-residence over the next month I’ll be working with Spread the Word to run writing workshops for four different local community groups, using the hippo as a start point for expressing our ideas and opinions about the Nine Elms area. New video for my poem inspired by Neasden Temple! Yipee! Today is the day I can share the video for my second commissioned poem as Brent Poet Laureate! Inspired by BAPS Shri Swaminarayan Mandir, which is commonly known as Neasden Temple, the poem explores the contrast between this quiet reflective space and the hustle and bustle of busy city life. Hope you like it! each gleaming white pillar is a spotlight of silence. 1.water, toilet roll, milk, bread. 2. Put a wash on. 3. Make a plan for the week – factor in time to be spontaneous. 4. Book advance train tickets for Thursday 12th. I read that Ganesh is the remover of obstacles. Smile at his one tusked elephants’ head and round belly. once everything is done to chill out. Stop. Ganesh’s father Shiva was the cosmic dancer. A green haze shimmers over distant goal posts and tennis courts. And the rumble of a goods train through Dudding Hill Junction. I am a witness to the last vestiges of Gladstonbury; a full nappy, shards of broken glass, a flipped off bottle top and a pink metal bangle. 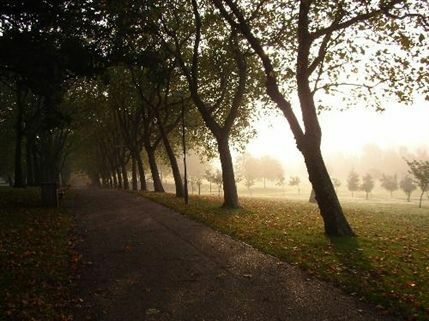 Gladstone Park is a microcosm of the universe enjoying more of itself. After all, the council is paying rates to keep the building empty. But the walls of this grand old house have been brought down. The local spaces that serve a community function. We’re a family of six, so we need a big block of Cornish with wafers. I can still taste them. – not much is left for either the older or younger generation. If Gladstone stood at his window now he would see the steel cradle of Wembley Stadium. Why did I return to Gladstone Park? Because I wanted to show the London Plane trees how much I’ve grown. Would tire me out; my limbs are longer, it looks much smaller now. Where is the witch’s hat, the see-saw and the roundabout? Health and Safety has put paid to risky pleasure grounds. Who don’t care that rust is falling off the railings and just the gates are painted red. The Plane trees have grown too. A living cathedral; flying buttresses formed of leaves and branches above my head. Only synapsing clouds and the sun, glinting off the slides, are higher than this edifice. Or did I return to Gladstone Park to say hello to Ken Livingstone, a local resident, don’t you know? “Sorry you lost the election,” I said. Sorry I didn’t vote for you, I meant. They’ve been so good in Brent. The careers of politicians often end up in failure. Can sunbathe in a black bikini, a zip divides her assets. Then rest awhile against the trunk of a well-chosen oak tree. I want to strap myself to it, to meditate and gain strength. A sea of fire is spilling across a petrol-blue sky. Tomorrow it will rise over the minaret in Willesden Green. On my way again, I’m careful not to tread on dusky bees in clover. And know myself now as a solitary bee without my family. Whose cupped spiny flower heads are the colour of the Aegean. And I have found my way back home. They let me film my poem at Wembley Stadium! As well as writing my own poems, it feels important that this project is about supporting other voices from within the borough to get heard too. The first of five free workshops I’m running around Brent took place at the new Wembley Civic Centre on a sunny Saturday afternoon a few weeks back – 10 Brent residents got involved, and I was genuinely impressed by the quality of the writing they came up with. There was a real range of content too; we had poems about Gladstone Park, a favourite local pub in Cricklewood, and the clock tower in Harlesden to name just a few! The next workshop is for children and families, and is on Thursday 15th August at Ealing Road Library. Find out more here! Sweat soaked, ink stained, appointment card. Mother tongue left at the door. And membership to the 60 million club. Can be a rare commodity.